I had eventually set foot in Nemi, after struggling on my Vespa, riding along the ever so busy and noisy Via Appia Nuova (just around thirty-ish kilometres away from San Giovanni square, very close to the city centre, the very heart of Rome), and while I was contemplating further down the colourful lake, enriched with the reflections of the trees and the clouds in an unpredictable and astonishing silence, you simply cannot but remember the fairy vision portrayed by William Turner. That meaningful countryside scenery and landscape in which a group of youths dances in a circle (yet, they all seem pretty young and immortal in this painting); in the background, lies the lake, whereas a non-distant female figure, holds and shows a tiny twig, as if it were a kind of agreed signal or, rather, a secret message. «Anyone who’s never heard of Turner’s Golden Bough?», writes James George Frazer. 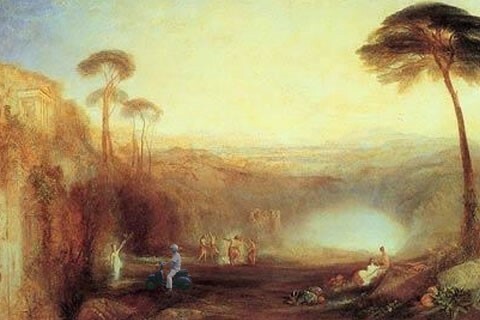 «The scene displayed in the painting, totally suffused and dimmed by that luminescent imagination with which Turner’s divine mind drenched and transfigured the most attractive and beautiful aspects and elements of nature, is but a dream vision of that little Lake Nemi, surrounded by wood, which used to be called “Diana’s Mirror” by ancient people. He who has viewed that water caught up amid the green cove of the Colli Albani, will never be able to forget it». Walking downhill from the village towards the lake, even the most stubborn or tenacious among the day-dreamers will have to admit being struck by the many environmental changes caused by building abuse devastation; moreover, well aware of the weird situation this place has been enduring throughout the centuries, right from the first century A.D., we still feel puzzled and curious about it. It was there indeed, both on the shore and inside Diana’s Sanctuary, of which some ruins may still be seen, that men used to duel to death in order for the winner to gain a religious position. Ceremonial though it may have seemed, it was just absurd and incomprehensible. Whoever wished to succed the cult minister in charge of the Sanctuary, known as the “King of the Wood” (rex Nemorensis), basically had to challenge him making sure he overwhelmed him physically as well getting rid of him once for good. The same would have happened to him in turn, sooner or later; it was a lifelong mandate, indeed, which had to be won back whenever the rex was challenged. This is thus how a murderer, doomed to be killed, turns into the one in charge of all the religious rites and rituals, not on the basis of spiritual merits, but rather on his capacity to defeat and eliminate an opponent. The “King of the Wood” could on no account become weak or get old as he was a representation of nature’s energy; by dying, he would not have only left his position to someone younger and tougher but he would have sacrificed his own blood offering it to the goddess. Diana, replacing an antique italic divinity, was considered as the protector of pregnant women and of the new-born babies: a solar goddess, an imparter of both cures and benefits as well as a lunar and gloomy inspirer of hellish misdeeds and therefore changeable, many-sided, difficult to define, a contradictory synthesis of various supernatural creatures. Being used to hunting her preys in the Nemi wood along with Egeria, the nymph of the spring by the lake, Diana never hesitated to punish by death any unprepared and ill-equipped young man who dared venture along those paths to make an attempt to her virginity. No sooner did the Romans start identifying her with Artemide, the “imported” goddess from Greece who did not disdain nor scorn human sacrifices than her becoming acquainted with blood rocketed considerably. As Igino, Emperor August’s librarian and author of a collection of myths and legends of his era, put it, the cruelty of these rites somehow «became disagreeable and unwanted». The aspirant to the priesthood, often happened to be a fleeing slave who had nothing to lose and who was thus trying to seize the day and get a chance to improve his condition; he would then tear a mistletoe bough off from an oak and was ready for the challenge. By waving out his bough, he intended to assume the responsibility for representing the most massive and enduring tree, in other words, nature’s strength, in order to triumph over death, to arrange for the soil’s fertility and for people’s good health. A mistletoe (Loranthus europaeus) is a plant which grows straight from the trunk of trees: a semi-parasitic organ that feeds on sap but is provided with chlorophyll. Thus suspended between earth and sky, it has always been given a great symbolic meaning. «The "King of the Wood" was but a personification of the oak’s spirit», affirms Frazer in his renowned and voluminous essay, entitled as is Turner’s painting, The Golden Bough, dedicated to the rough and brutal duel. Svetonio, the great historian, reports that this gloomy ceremony was still in force in Caligula’s days: considering and labelling the "King of the Wood" as someone who was far too old, the Emperor had ordered a young slave to go to Nemi Sanctuary and supplant to priesthood, that is to commit the ritual homicide. (Later on, the duel in question was a mere “staging sham” performed by professional actors). Where did the challenge actually take place? Initially (but we are dealing with a starting point whose origins cannot be traced back), in an unspecified and undefined spot in the wood around the lake shore; it is probably in the glade where Diana’s Sanctuary was built (in the fifth century B.C.). Later on, still within this very Sanctuary, a tiny theatre was erected, which became the final location for the violent ritual. Incredible though it may sound, this priceless and invaluable archaeological treasure is buried a few metres away from the lake shore, hidden and concealed by an obviously abusive detached house. First and foremost, by deduction, we may affirm that the duel for the succession of the “King of the Wood”, that is the most important ritual at the Sanctuary, took place right in the tiny theatre, not at a public theatre the way they were found in Rome and all over its empire, but rather in a spot which was exclusively used for the religious cult (such as, among other devotional practices, the one dedicated to goddess Iside). 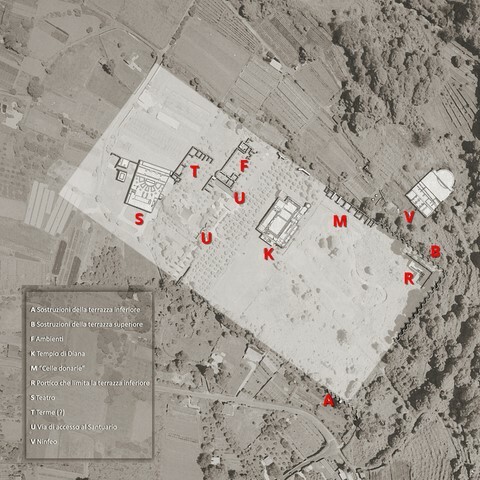 There are also some relevant archaeological “evidence” (namely epigraphs and effigies on marble), some finds which are retained and stored at the Roman National Museum (Museo Nazionale Romano), documented and recorded at the Latium Department for the Archaeological Heritage archives (Soprintendenza per i Beni Archeologici del Lazio); I am delighted to be able to rely on such an authoritative confirmation coming from Giuseppina Ghini, the current Director-Archaeologist for the Latium Archaeological Heritage, who has been dedicating decades of intensive and thorough studies at the archaeological site in Nemi and more specifically at Diana’s Sanctuary. It is currently impossible to figure out whether the building is basically abusive or complying with the urban rules in force via repetitive amnesties for infringements of building regulations as well as provisions and limitations obtained over the years. Obviously, it should have never been built. 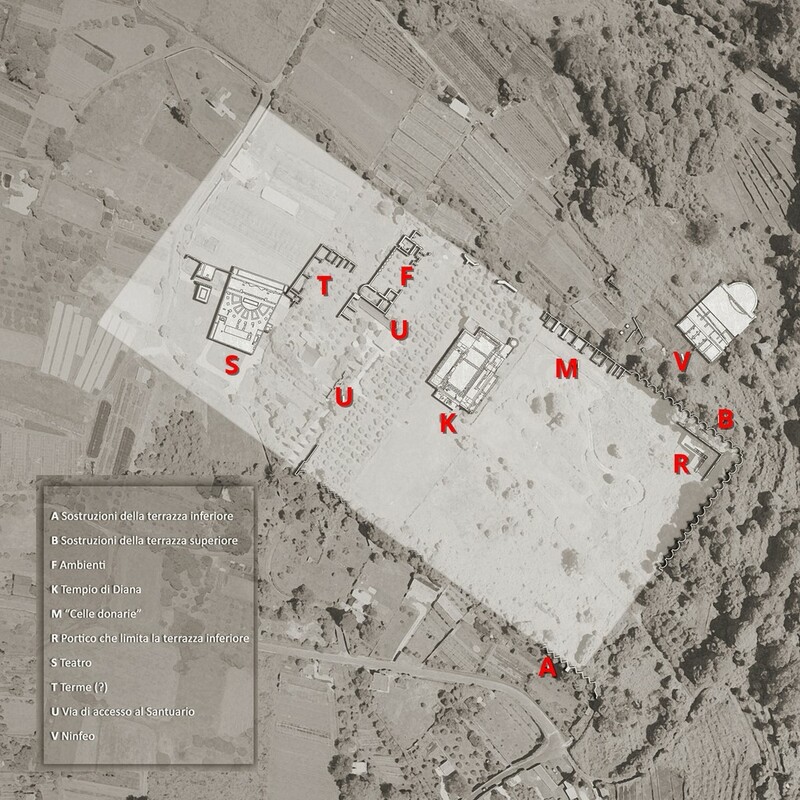 We do have the Superintendence documents and alerts, the pictures regarding the little villa, the theatre maps: this could be sufficient to order its seizure and dispossession; we could go on to demolish and pull the villa down; we could then pass on to do up another of these important existing archaeological items that may be exploited around Nemi lake: the Sanctuary, as a whole, the ever so antique artificial emissary, “Caesar’s villa”, the finds at the Museo delle Navi (Nemi Naval Museum)... All of this may be added up, considering the environment, to the charming and enchanting group of houses lined up on the rudimentary and primordial volcanic lake shore. Incidentally, I do wish to report the words written by Stendhal in his Passeggiate Romane (Walks in Rome & Roman Tales): «I look up to the tiny village of Nemi as the headquarter of Beauty in Italy». A basic sentence which, apparently, is totally unknown or ignored in Italy. This does happen to be a find as well, something ever so precious to be unearthed. In order for you to check out the quotation, you should refer to the original version of the text (Promenades dans Rome, Gallimard, 1973, page 658) as well as the Italian edition (Passeggiate Romane, Garzanti, 2004, page 39). The unbearable red tape and the scarce local administration resources which have alternated and followed one another in Nemi have furthermore denied any form of touristic assets. The theatre itself may well not be buried under a cement casting but it could constitute and represent the basement of the villa. A very evocative and appealing repository indeed. The rex Nemorensis’s blood used to flow where you may now find fruit tins and jars as well as bottles of wine from the Castelli Romani. In April of last year, the Nemi lake bottom was fathomed and plumbed in search of a Roman ship, the so-called Emperor Caligula’s “third ship”, with a negative result. (The first two vessels, saved during the 1930s from a millenary oblivion, burnt down during the summer in 1944). 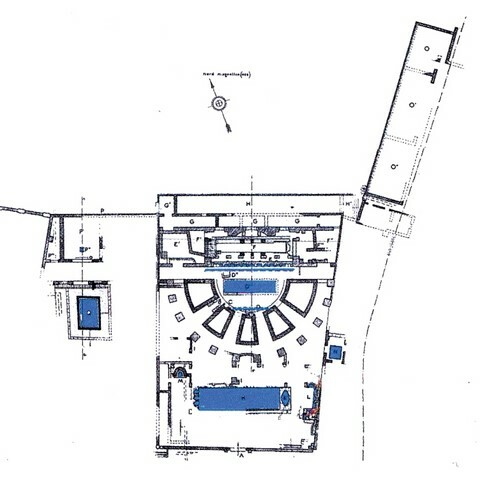 In order to verify the present state of the theatre, none of the sophisticated tool or device that have been used so far is required so to search the supposed and hypothetical vessel which lies on the lake bottom. All you need to do is just knock at the door and see for yourself. (Ghini 2017. Elaborazione Studio Strati) La S indica il teatro. © Roberto Varese. All rights reserved. Traduzioni in lingua inglese di Maria Rosaria Dimonte, Bob Hocine Salmi e Dama Lloyd Thomas.